Three bear brothers live with their mother in a picture perfect house by the ocean. One day these squabbling siblings accidentally break their mother's favorite shell, so the boys set sail to find another. On their big sea adventure, they visit some magical islands and meet some wise sailors, see an enormous whale and a survive a terrifying storm. But they don't find a shell like their mother's favorite one. Will they make it back to the house? And will mother bear forgive them? 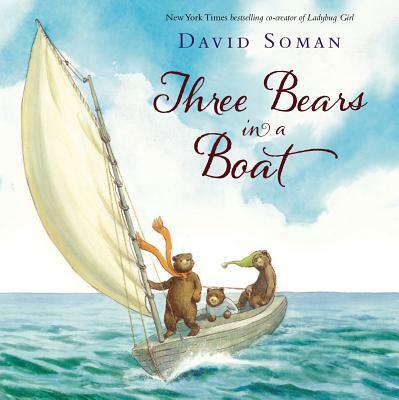 This is a truly charming picture book with beautiful and accomplished watercolor illustration by Soman (who is the co-author of Ladybug Girl) . Despite it's nursery-rhyme-like title the book is actually for slightly older children. There are a lot of complex themes here; how families come together in adversity, how a mother will always forgive her children and that there's no place like home. I also think it has an excellent last line. All of which makes it a perfect holiday gift book for ages 5-7.